Rising Interest Rates: Good Or Bad For The High-Yield BDC Sector? This is a short series of articles to identify which BDCs are better positioned for rising interest rates. Three-month LIBOR is now over 100 basis points, and many BDCs are starting to experience higher interest income from investments. However, for BDCs with higher risk portfolios, there could be increased defaults from portfolio companies that are not able to support higher debt service payments. Also, many BDCs have experienced higher borrowing rates on variable rate credit facilities. As discussed in previous reports and public articles, an increase of interest rates by up to 100 basis points (1%) is not meaningful for most Business Development Companies ("BDCs") due to interest rate floors on investments. 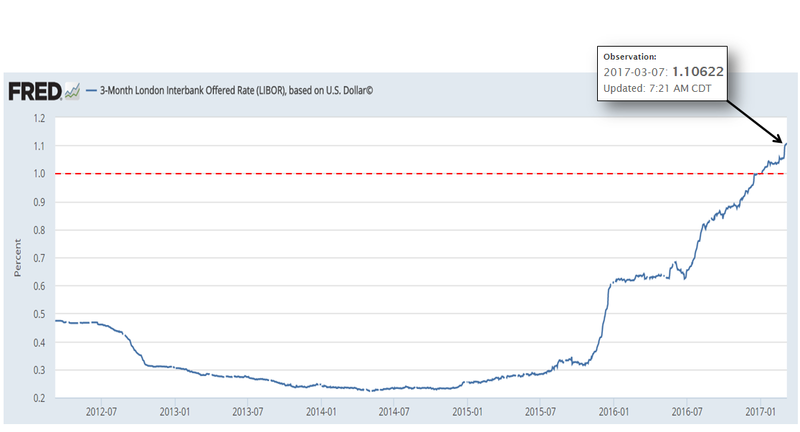 However, LIBOR continues to rise, and the three-month LIBOR rate is now over 1.1%, and many BDCs are starting to experience increased income from portfolio investments. As discussed in my previous "Interest Rate" articles, there are many pros and cons to rising interest rates including changes in values of assets and liabilities, increased borrowing expenses for variable rate borrowings, decreased earnings from structured products including CLOs and joint ventures with off balance sheet leverage and, of course, increased earnings on variable rate investments. Fed officials previously anticipated three rate hikes in 2017, but that might move up to four, given the recent uptick in inflation and continued strength in the jobs market. 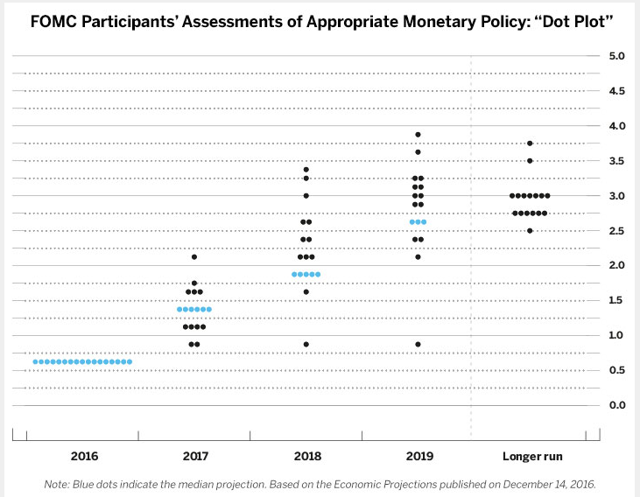 After the FOMC press conference later today, we should have a better idea of where rates are headed. Important Note: Increased earnings from portfolio companies could drive higher default rates for companies that are not able to support the increased debt payments. For all previous articles on interest rate impacts, risk rankings, dividend coverage potential, expense ratios, the timing of BDC purchases, please see "Index to Free BDC Research." "Interest rate sensitivity refers to the change in earnings that may result from changes in the level of interest rates. Because we fund a portion of our investments with borrowings, our net investment income is affected by the difference between the rate at which we invest and the rate at which we borrow. As a result, there can be no assurance that a significant change in market interest rates will not have a material adverse effect on our net investment income." That is how most BDCs describe the interest rate risk section of the "Quantitative and Qualitative Disclosures About Market Risk" section in the financials that is usually followed with some detail indicating how the company would be impacted by rising interest rates. As shown in "Reaching For Yield Part 3: BDC Risk Profiles," BDCs such as Prospect Capital (NASDAQ:PSEC), Hercules Capital (NYSE:HTGC), TICC Capital (TICC), Medley Capital (NYSE:MCC), Horizon Technology Finance (NASDAQ:HRZN), Capitala Finance (NASDAQ:CPTA), Saratoga Investment (NYSE:SAR), Gladstone Capital (NASDAQ:GLAD), Newtek Business Services (NASDAQ:NEWT) and Apollo Investment (OTC:AINV) have much higher borrowing rates than other companies, but usually due to positioning the balance sheet for higher interest rates with fixed-rate borrowings. Most of these companies will have limited incremental borrowing expenses as LIBOR continues to rise, but keep in mind that they are already paying higher rates on borrowings. Other BDCs with higher amounts of fixed-rate borrowings include FS Investment Corp. (NYSE:FSIC-OLD), PennantPark Investment (NASDAQ:PNNT), Triangle Capital (NYSE:TCAP-OLD), Ares Capital (NASDAQ:ARCC), Fifth Street Finance (FSC) and Main Street Capital (NYSE:MAIN). SBA Debentures: On December 18, 2015, the Small Business Administration ("SBA") raised the "family of funds" limitation to $350 million in total borrowings giving BDCs potential access to lower fixed-rate borrowings for 10-years interest only and exempt from typical BDC leverage ratios. This is an excellent source of low cost capital, but there are certain restrictions from the SBA regarding "eligible investments" and usually involves a more selective credit platform. BDCs with Small Business Investment Company ("SBIC") licenses include HTGC, MAIN, ARCC, TCAP, MCC, PNNT, FSC, Fidus Investment (NASDAQ:FDUS), Golub Capital BDC (NASDAQ:GBDC), Monroe Capital (NASDAQ:MRCC), New Mountain Finance (NYSE:NMFC) and TCP Capital (NASDAQ:TCPC). Also, TriplePoint Venture Growth (NYSE:TPVG) has been adjusting its capital structure to accommodate a potential SBIC license. Many of the BDCs with lower borrowing rates in the article linked above have higher amounts of variable rate borrowings usually with credit facilities tied to LIBOR including PennantPark Floating Rate Capital (NASDAQ:PFLT), Goldman Sachs BDC (NYSE:GSBD), TPG Specialty Lending (NYSE:TSLX) and Solar Senior Capital (NASDAQ:SUNS). However, these companies also have higher quality portfolios (assets) with mostly variable-rate investments and will likely adjust their capital structures to maximize net interest margins. Personal note: I have updated my positions to reflect changes in my holdings, but please keep in mind that some of the positions are very small and mostly for research purposes. There are over 50 publicly traded BDCs, and I try to cover as many as possible, but I do not have the bandwidth to include each company for each article.